The nutriceutical industry is bombarded with ‘miracle medicines’ claiming to cure all that ails you, however without any regulating body these over-the-counter non-prescription pills are too varied for the consumer to make sense of when faced with 5 feet of choices at your local superstore or pharmacy. Now, the reality is that some molecules actually do have merit and have been shown in repeated studies and world-renowned institutions like John Hopkins Hospital to have medical efficacy in a variety of conditions. In this article, I will reveal my top 3 picks for nutriceutical supplements for the eyes for 2013 and why. These picks are based on my research and my clinical work with these supplements. A little background here: I have worked with A LOT of supplements over my career and I have scrutinized claims made in scientific literature in clinical settings. I chose them after a detailed due diligence on my part and to be clear I have no financial interests or ties to any of the listed products. Now, I’m being very specific here about the PRN formulation for a few reasons which will be explained shortly. Omega 3s have been historically shown to be essential nutrients derived from dietary consumption. Our bodies cannot produce or store this molecule so where we get it is the only variable we can control. Natural sources of O3’s include plants and animals each with their own unique form. Plant sources, flaxseed being most recognized, contain alpha-linoleic acid and marine animals contain the triglyceride form. From a physiological perspective alpha-linoleic acid (ALA) forms are less bioavailable then triglyceride (TG) forms because the enzyme required to convert ALA to O3, delta-6 desaturase, can be pre-occupied with Omega 6 conversion of pro-inflammatory factors. That’s right – flaxseed in the average omega 6 rich North American diet will not convert to EPA/DHA as readily and will likely add to pro-inflammation. Triglyceride O3 are available as unpurified, ethyl ester (EE), and re-esterified TG (rTG) forms and with each step the cost of production rises – For good reason. Unpurified forms, the least expensive, are just that and have all the toxins and impurities that come with pressed oil directly from fish. EE forms, which cost slightly more, have been pressed and heat purified using ethanol to convert the TG to and EE which is less bioavailable (Dyeberg J, Nutrition 1995). rTG forms go through the same process as EE but are the ethanol is removed (re-esterification) and replace with the triglyceride backbone. This critical extra step does add to the production cost, but the absorption of rTG O3 nears 100%. It is this small difference that minimizes the gastrointestinal distress, heartburn and fish-burps you experience with many over the counter EE forms. Dry Eye Disease (DED), macular degeneration (AMD) and other ocular diseases with known inflammatory roots benefit from this supplementation. A recent study by Dr. Gregory Smith MD demonstrated that 82% of patients treated with rTG (1,680 mg EPA/560mg DHA/1,000mg vitamin D) had changes in their oil gland secretions at 8 weeks. rTG O3 is the closest to direct pure fish derived O3 and is a key differentiator in quality of the vast array of choices. For my ocular surface patients/dry eye patients, I see PRN formulation of rTG O3 being a standard all other formulations should be measured against at a minimum dosing of 2000 mg/day. Patients should consult there eye physician prior to taking particularly those on blood thinners. Once touted as the next fountain of youth due to myriads of publications demonstrating its cardiac and ‘anti-aging’ health benefits received a big blow to its momentum in January 2012 when Dr. Dipak Das was accused of scientific fraud in a dozens of his publications asserting its efficacy. A midst this brewing controversy, Dr. Stuart Richer OD PhD FAAO has been studying the molecular effects of this drug on the aging eye – specifically eyes with age-related macular degeneration. ndothelial growth factor gene (VEGF) which is a welcomed alternative to intraocular injections of anti-VEGF drugs for wet AMD patients (Richer S, William S, et al University of Illinois (UIC), Retina Service, Eye and Ear Infirmary, Chicago, IL 2011). The image to the right is a before and 18 days after resveratrol administration (no other forms of treatment). Normally this reduction in lesion size can only be achieved through intraocular injection of anti-VEGF. I do however acknowledge although the natural course of wet AMD tends to worsen, there are cases of self resolution without treatment. In Dr. Richer’s study, however, he demonstrated the repeatability of this finding in 18 patients. As a practitioner, the potential of this molecule in specific vascular diseases like AMD is immense. Patients undergoing medical management of AMD should be aware of the brand Longevinex because of its micronized/microencapsulated powder form which allows for slow release of the trans RV. This drug specifically has been used in several eye related studies and the inclusion of vitamin D3 is a key component. I would argue that we have yet to see the full ability of this molecule to improve vascular health. The yellow pigment found at the macula is a distribution of carotenoids L, Z and MZ which are 3 of over 700 found in nature. Together these 3 pigments are known as the macular pigment (MP). MP acts as a filter for blue light and as an antioxidant which is believed to protect against AMD (Snoderly, 1984). In fact studies have indicated that the combined ability of the 3 MP’s to quench singlet oxygen/free radicals therefore reducing oxidative stress is greater than the sum of their parts (Binxing Li, et al 2010). Several studies have examined serum concentration of MP’s in response to supplementation and demonstrated that the combined consumption can very depending on the cocktail in question. The British Journal of Nutrition in September 2012 published a paper demonstrated a specific proportion (10 mg L,2 mg Z and 10 mg MZ) produced the highest serum concentration in a small group of patients using HPLC (high performance liquid chromatography). By optimizing serum levels of MP, this makes it more bioavailable for capture by the retinal tissue. MP density at the macula has been shown to be diminished in patients with AMD and it is possible that patients with a reduced MP profile may be at increased risk for macular disease. The AREDS II study, yet to be published, has included L and Z as treatment arms and preliminary results confirm the importance of carotenoid supplementation. Unfortunately MZ wasn’t included in AREDS II, however with the growing body of science supporting the use of all 3 carotenoids vs. L and Z alone it stands to reason to supplement all three inclusively. MacuHealth is a unique supplement that combines all MP’s which is key as MZ is hard to come by in supplement form. As the study of MP continues to evolve, MacuHealth seems to remain at the forefront of preventative treatments for macular disease. And that rounds out my top 3 nutriceuticals to watch and perhaps consume in 2013. My approach to health care is evidence-based and to my patients and colleagues alike, I do put a great deal of work into what I recommend to you. I encourage you to seek alternatives but to weigh them out in addition to determine if it is truly an effective alternative. As always do consult your eye care physician when deciding whether supplementation is warranted and/or safe. Variability of symptoms is the hallmark Dry Eye Disease (DED). From the asymptomatic diabetic patient with corneal hypoaesthesia to the contact lens intolerant patient who has no ‘apparent’ corneal findings and drops out of lens wear – basing therapies on symptoms may lead the eye physician in the wrong direction. Clinical signs are key, but as important is the recommendation for the correct over-the-counter product to suit the needs of the patient. Retail pharmacies have several feet of choices that should be directed by a doctor to ensure symptomatic improvement and prevent further insult to the ocular surface. With the majority of our patients having some component of dry eye stemming from lid disease related evaporation, it makes sense to supplement the tear film with a stabilizing component like our naturally occurring lipid layer. Systane Balance (Alcon) and soon to arrive in Canada Optive Advance (Allergan) are two good examples of oil emulsified drops which help to replicate the biphasic nature of the tear film. This better allows the aqueous component to be evenly distributed over the ocular surface, and slows evaporation. Note that mineral oil is part of the composition, which helps to neutralize fatty acids found in frothy tears – these fatty acids contribute to the burn and can also cause angular blepharitis. Mineral Oil is an excellent adjunct to maintaining the lid surface. Try applying to the lid margin with a cotton-tip applicator on patients with frothy tears. It not only soothes the surface, but neutralizes the acidic insult to the meibomian gland orifice. The necessary evil of benzalkonium choride has been a thorn in the ocular surfaces side since inception. Studies continue to show that exposure to BAK 0.1% causes a decrease in nerve fibre density and a reduced aqueous tear production. In patients with noted hypersensitivity to BAK (most eyes), there are now a plethora of good options like Refresh (Allergan), Systane (Alcon) and TheraTears available in unit doses. Albeit more expensive to the patient, the chronic dropper should be directed towards non-preserved topical options. Use of thicker eye drops can be a double-edged sword. The blurry vision, and crusty debris laiden tearfilm from residual particles can often worsen symptoms; however with a new light uncovering exposure and impartial blinking due to the micro-anatomy of the lids (Line of Marx and lid seal) in more and more patients a hyperviscous solution may be warranted. Liposic Gel (Bausch and Lomb) and Refresh Liquigel (Allergan) sit closely by my dry eye clinic chair and are valuable tools in my kit. Now this list is by no means exhaustive but by making clear and specific prescribed directives to our patients can set them up for success in a potentially dry world. Understanding that the eyelids have a very large role to play in the dry eye world and maintaining them first is key in managing this patient base. Throwing water blindly at the eye may not be the solution, but when needed there are some very useful OTC drops for each case. Don’t let your patients choose the wrong one – make the choice for them because they aren’t all the same! Blinking has always been known to have 2 purposes: 1) to clear away debris from the tear film and 2) to replenish the tear film to allow the cornea to remain a clear optical surface. When we sleep, conventional wisdom suggests that the eyelids meet halfway and form a seal that prevents exposure of the cornea throughout the night. Nocturnal lagophthalmos is an anatomical state whereby the superior and inferior lids fail to meet resulting in exposure of the conjunctival and corneal surfaces at night. These patients typically present with symptoms of persistent dry eyes, recurrent corneal erosions, and often have a psychological impact due to constant questioning of their red eyes by family, friends and co-workers alike. There is evidence that suggests that in the general population 1.4% of patients have some form of lagophthalmos. A deeper look at the finer anatomical structures of the eyelid suggest that our blinks have a different purpose, and in fact may not be as efficient at closing the gap on our dry eyes. The lids meeting is contingent on the anatomical reach of of lids, but as important is the seal created by the meeting of the superior and inferior line of Marx (LOM). With reduction in lid laxity with age, changes in lid tension by blepharoplasty and less frequent and deliberate blinking with computer/smartphone/tablet use this ‘seal’ is not always present. The result is an eyelid overbite, where the upper eyelid falls slightly anterior to the lower eyelid causing the LOM’s to miss each other and therefore no true touching of the upper lid to the lower lid. An often overlooked function of the blink is to create a negative pressure to draw meibum or oil out of the meibomian glands (MG) when the lids touch. If they don’t touch, then this negative pressure cannot stimulate expression of the oil from the gland and will create an oil deficient eye, susceptible to evaporative dry eye (EDE). Over time, inactivity or reduced activity of the MG will result in stagnation of meibum and MGD ensues. Clinically, we can see this in various degrees within the symptomatic patient, however the asymptomatic patient has signs as well. How can a practitioner determine if the lids are meeting microscopically? Using a slit lamp and looking for smile staining on the cornea/conjunctiva means looking for chronic signs of exposure, which aren’t always there in the early stages. There is an onset of physiological changes within every disease and a simple use of a transilluminator will reveal a very telling sign. Dr. Donald Korb OD FAAO, has used this technique in practice for years and it is now incorporated into every consultation I see in my dry eye clinic. The example below demonstrates the ‘light leakage’ sign indicating a break in the seal of a blink. On SLE, this patient appears to have good closure and no obvious staining patterns were associate, however she presented with severe dry eye symptoms but normal aqueous production. On identification of the broken seal, she was tested for non-obvious MGD (NOMGD) and lid wiper epitheliopathy (LWE) which was confirmed. This is the eye-equivalent of an overbite and is a telling indicator of exposure and potential future MG dysfunction. These patients benefit from exposure therapy such as moisture chamber goggles, hyper-viscous topical agents at night, manual lid expression and regular assessment of the lid wiper and line of Marx for epithelial changes and accumulation. Compression on the lid of these patients should be done with caution as fine debris can enter the broken seal and abrade the cornea as well patients should be educated on corneal warpage post compression. The micro anatomy and complex coordination of a blink can and in fact does break down with age, cosmetic surgery and with environmental factors. Closer evaluation of the lid surface as it relates to chronic disease progression doesn’t require symptoms to be present. The role of the primary eye care physician is to provide front-line care which helps in the prevention of eye disease. Dry eye, having a population of 100 million globally , as stated by TFOS in 2011 may have it’s roots firmly planted in the lid. A 60 year old female of Egyptian heritage reported for a routine assessment. She spoke her native language, Arabic, and had very limited verbal and written English proficiency. Her pertinent medical history was difficult to obtain as she came alone and did not bring a list of medications or allergies. The ophthalmic technician was able to obtain a partial history, whereby the patient had previously been to an eye doctor in the United States 3 times within the last 3 months. She was not specific as to what procedures, if any, had been performed or for what reason she had assessed. Her chief complaint was “foggy” vision over the left eye with a vague onset of 6 months. This was obtained by having the patient flip through a calendar in her personal diary to show when she started having problems. She gestured with her hands that she had “pressure” for which she was taking a pill. This was assumed to be systemic hypertension under some sort of medical management. Final refraction was pl -0.50 x 180 OD yielding 20/20-1 and +0.50 DS OS yielding 20/30-1. Fluorocaine eye drops were administered OU followed by IOP measurements with Goldmann applanation. OD and OS were equal at 12 mmHg and pachymetry readings were 556 and 560 microns OD/OS respectively. One drop each of Mydriacyl 1% and Phenylepherine 2.5% was instilled OU. Dilated ophthalmoscopy was completed using 90D lens and peripheral ophthalmoscopy with 28 D lens. Optic nerves were both pink and healthy with healthy rim tissue OU. CD ratio of 0.20 OD/OS was measured. Artery/venous ratio was observed OU to be 2/3. Peripheral retina revealed no holes, breaks or tears OU. 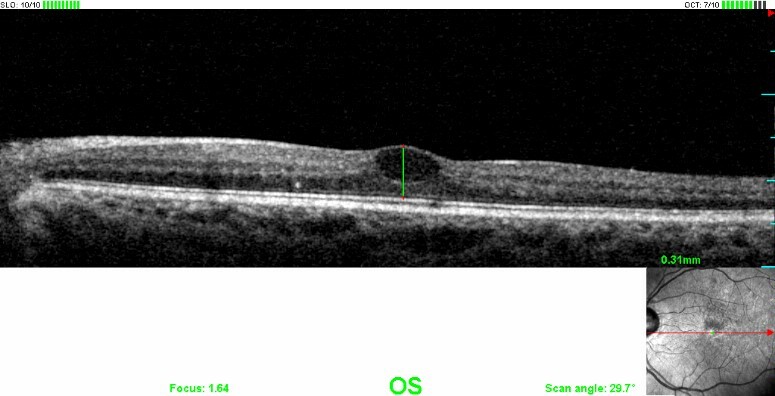 Macula OS showed no reflex with 20 vague pale lesions extending superior to the macula that were less than 125 microns in size (see Figure 1). There was a resolving nerve fibre haemorrhage in the superior temporal quadrant as well. There didn’t appear to be any findings consistent with edema, however additional imaging was ordered to rule this out. OD retina was unremarkable. Figure 1. OS fundus image. Based on the above imaging, the clinical picture became clearer. FAF, demonstrated an evenly distributed pattern of over thirty scattered hypofluorescent circular areas that were concentric around a branch arteriole/venule. Additionally, these areas were noted to be crossing superior to and encroaching on the superior macular region. This decreased signal indicated a diminished presence and, in fact, an absence of lipofuscin in the area due to dead or atrophic RPE. The even spacing and ‘intentional’ pattern suggested this was not physiological but likely induced. OCT demonstrated a small pocket of fluid in the supramacular region at the inferior border of the FAF hypofluorescent spots. This fluid explained the decreased vision noted and added to the sequence of events that preceded this visit. A clinical hypothesis was reduced to the following: The induced local areas of atrophic RPE were as a result of grid argon or krypton laser photocoagulation to treat a BRVO which was located superior to the macular region resulting in macular edema. The superior occlusion likely resulted in local edema which was noted in the gravity dependent macula. According to the Branch Retinal Vein Occlusion Study (BRVOS) grid laser was indicated in patients whose vision was reduced to at least 20/40 or worse secondary to edema within 3 to 18 months post-occlusion (1). The OCT in this case demonstrated residual edema present which coincided well with the expected time frame of the patient’s first reported symptoms (6 months previous). This time frame was also consistent with the last eye exam in the US from her previous physician. Closer examination of the FAF pattern revealed a non-uniform pattern of hypofluorescent between laser scars. This suggested that there were likely multiple laser treatments done at different times, resulting in chronological stages of atrophy between treatment zones. Going back to our patient’s history, she reported 3 visits with her previous eye physician which corresponds to the multiple treatment theory. 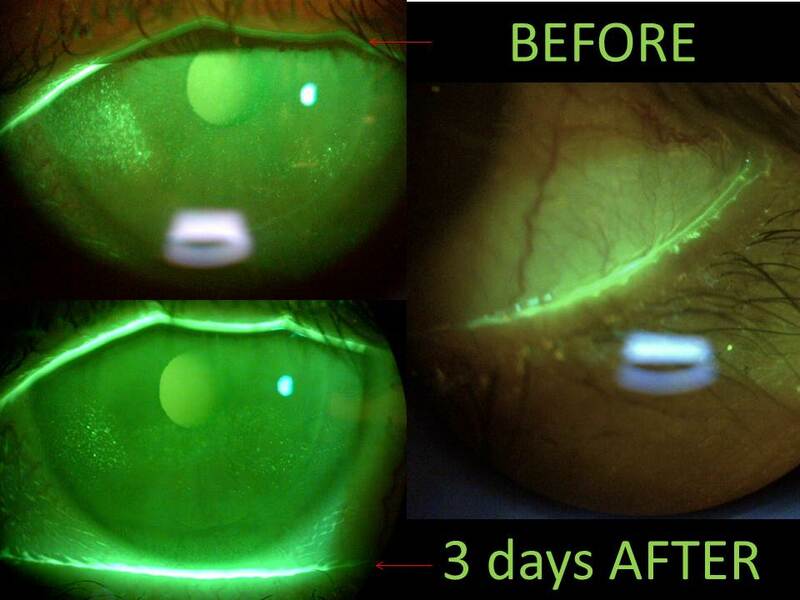 Once vision was restored to the clinical endpoint above 20/40, laser treatments were no longer indicated and the patient was likely advised to return to follow up with routine care. Using Multispectral Imaging (MSI), remnant nerve fibre hemorrhages were apparent in the area associated which are indicated by the arrows in figure 4. All the clues had added to the clinical diagnosis of BRVO with macular edema. The clinical decision at this point was made to have the patient return with a family member who could confirm the hypothesis to then determine a course of action. The patient and daughter returned 3 days later and confirmed the BRVO and laser treatments performed in the US. The daughter produced a report describing the satisfactory result of reduced edema and improved BCVA to an ‘acceptable’ level. Fluorescein Angiography was conducted at the time of initial diagnosis which confirmed capillary perfusion to the area. Instructions were to follow the edema monthly until resolution or otherwise, which time may call for further grid laser. The physician had considered a final treatment prior to discharge with subthreshold micropulse diode (SMD) laser photocoagulation. This was not done however, given that the endpoint acuity was achieved. In follow up, this patient’s residual edema had resolved evenly over the following 2 months and BCVA improved to a final 20/25. There are multiple areas of discussion that arise out of this case. The two most obvious of which are: 1) The pathology and management of BRVO and 2) The method of deductive reasoning and its role in diagnoses where limited pre-visit information is available. BRVOs are the most common type of retinal occlusive events as noted in the Beaver Dam Eye Study (2). 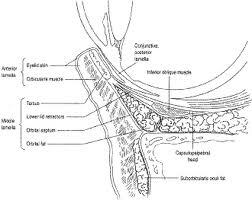 The arterial vascular supply to the retina drains into the venous system which carries back to the central retinal vein. In a BRVO, a blockage at the venous level results in a backup into the capillary and arterioles that feed the drainage system. 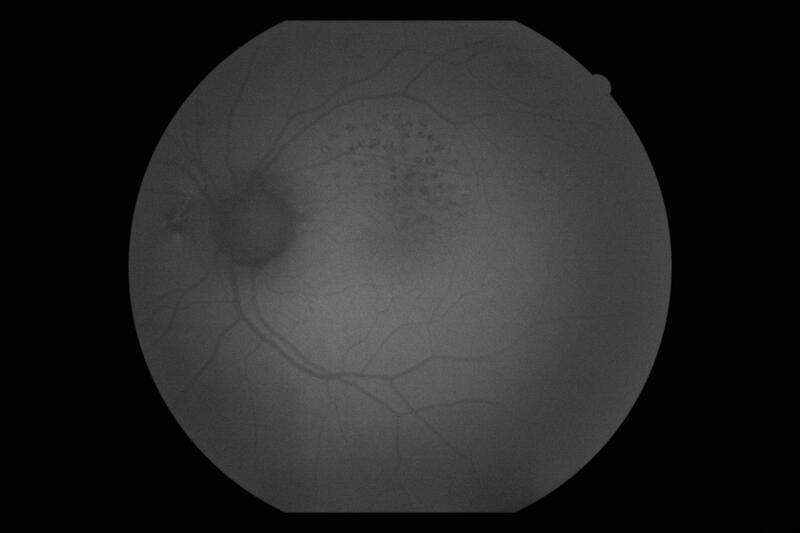 This back up results in a leakage of blood and fluid into the intraretinal space and the site of occlusion determines the extent of the bleeding and edema. Smaller veins result in quadrantal occlusions with larger veins resulting in hemispheric. The site of occlusion generally occurs at the most proximal and central area of an artery crossing a vein. Depending on the relative location of the BRVO to the macula, the risk of macular edema increases. Superior BRVO’s are subject to the effects of gravity drawing the intraretinal fluid downward into the macular space (3). The natural history of BRVO can be self-limiting, however risk of neovascularization and edema determine the need for intervention (3). The likelihood of visual recovery without intervention to better then 20/40 was low according to the Center of Eye Research in Melbourne Australia (3). Most predictive of a good recovery is the more distal the location of occlusion to the disc (BRVOS) in addition to the lack of non-perfusion on angiography studies (1). If the area involved was shown to be ischemic, then the effect of intervention was limited with a guarded prognosis (1). The Branch Retinal Vein Occlusion Study is the only multicenter randomized prospective trial from which treatment guidelines were derived. The criteria included, but not limited to, vision below 20/40, capillary perfusion to the affected area, sufficient clearing of haemorrhage and angiography confirming leakage involving the fovea. 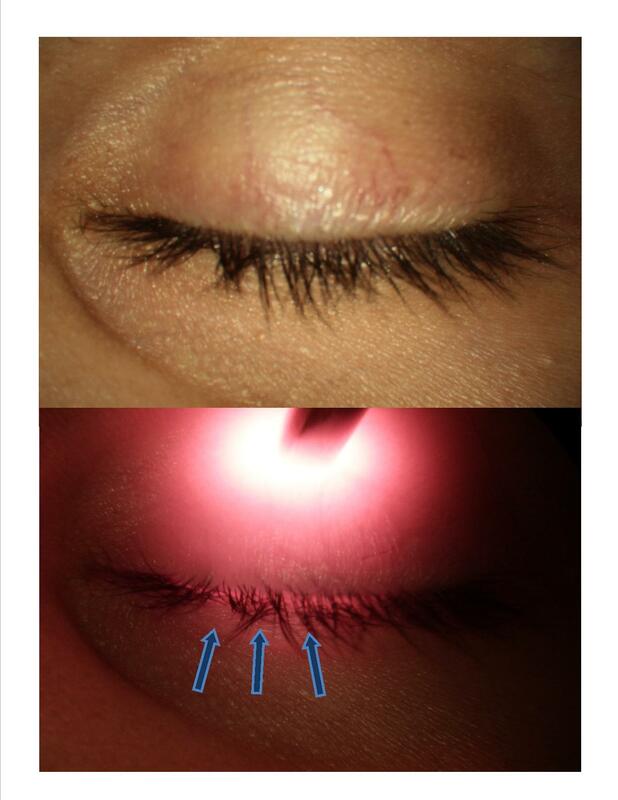 Eyes were randomized to argon grid laser vs. a control group and were followed to completion at 3 years. The concluding findings of the study demonstrated that intervention with grid laser resulted in improved vision above threshold (20/40) and reduced risk of neovascularization (1). The standard used in the BRVOS was the argon laser which causes photocoagulation to the retina by absorbing radiant energy causing protein denaturation in the region (4). Laser energy initially is converted into heat mainly in the melanin of the RPE cells and choroidal melanocytes. Traditional laser burns create a radial wave of heat from the origin of the burn site within the RPE and/or choroid. The discoloured grayish endpoint in conventional threshold photocoagulation signals that overlying neurosensory retina has been reached by the heat wave at a temperature high enough to damage the natural transparency of the retina (5). The biological effect of the laser is unlikely in the cauterization of microaneurysmal changes, but rather the upregulation of biochemical mediators with antiangiogenic activity, such as pigment epithelium derived growth factor (PEDF) (6). Additionally, the laser burns stimulate factors that activate inhibitors of vascular endothelial growth factor-angiogenesis and reduce VEGF inducers thereby reducing vascular permeability (7). Subthreshold micropulse diode laser photocoagulation (SMD) is designed to target the RPE melanocytes while avoiding photoreceptor damage. The term ‘subthreshold’ denotes the energy level of the laser being below which visible damage to neurosensory retina would occur. This results in no visible damage to retina either ophthalmoscopically or by FAF or angiography. In these instances, history would be the only means to determine if SMD was used to treat (8). One study compared the effect of SMD grid photocoagulation to conventional threshold grid photocoagulation in 36 eyes with macular edema secondary to BRVO. The number of SMD laser spots required to achieve endpoint was higher than threshold laser. However at 2 years post treatment, the SMD group had a 3 line or more gain in acuity (ETDRS) in 59% of eyes vs. 26% in the threshold group (9). SMD, by having a reduced collateral effect, may be indicated for longer term stability and improved efficacy in certain cases and likely the rationale for the treating physician’s recommendation for a final treatment using SMD in his report. Intravitreal injection of triamcinolone has been used to treat macular edema of different etiologies because of its potent anti-permeability and anti-inflammatory properties. 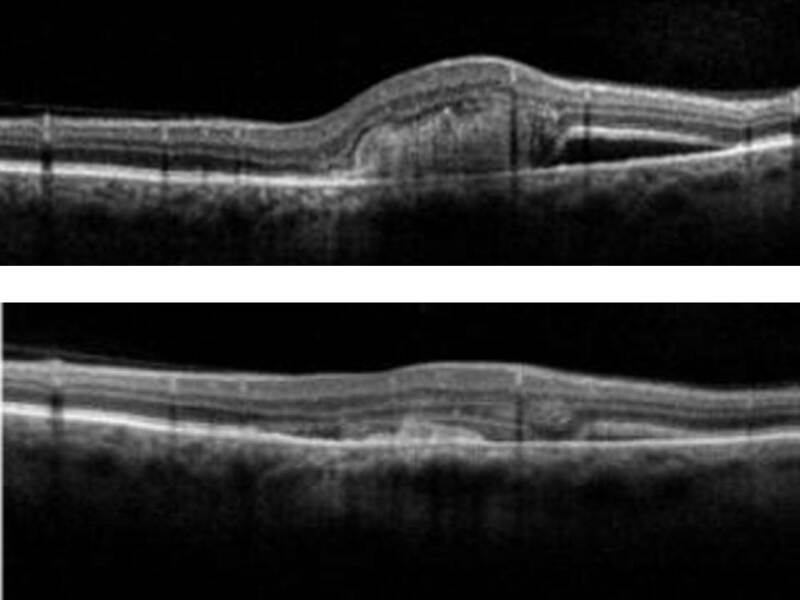 A few cases of macular edema secondary to BRVO treated with an intravitreal triamcinolone injection have been reported. The exact dose remains unclear however doses ranging from 4 mg to 25 mg have been reported to be effective (10). AvastinTM (Bevacizumab) has been involved in several small retrospective and uncontrolled case series which suggest that intravitreal injections at doses up to 2.5 mg are effective in improving visual acuity and reducing macular edema secondary to BRVO. These results are often seen within 1 month of injection; however, most of the eyes required additional injections to maintain the effects of bevacizumab (11) (12). From the above example, a case can certainly be made for the use of thorough testing to unveil a diagnosis, but what is likely more crucial are the small pieces of history that were obtained. Combining this information and correlating it with the evidence presented by clinical exploration allows the full history to unfold. Deductive reasoning in this examplewas the final diagnostic tool to give the most appropriate course of action for this patient. It is possible that, without the historical information and deduction, this patient may have been referred for intravenous fluorescein angiography (IVFA) for further invasive scrutiny of the retina. IVFA of course has known side effects that range from nausea to cardiac arrest. By working through the case backwards, this unnecessary step was avoided and appropriate observation was indicated. Current discussions in all clinical practices revolve around standards of care and how clinicians can rise to that standard. One question illustrated by this case is, ‘is a standard enough?’ Is common ground the best way to drive health care decisions? Establishing a standard requires common agreement of the majority of a spectrum of clinicians based on current evidence and available tools. However in this scenario where the common denominator dictates what practitioners should and should not do, this actually reduces the standard to, arguably, a lower quality of care. Individual standards give the practitioner the opportunity to think outside the box and truly reach a higher calibre of care. In that context, using an intuitive tool like deductive reasoning, which, according to Piaget’s theory of cognitive development is established as early as shortly after birth, can turn a lack of communication from a patient into an opportunity to solve a mystery (13). This can turn the average eye care provider into a sleuth with seemingly extraordinary powers; a superhero among all. 1. Argon laser photocoagulation for macular edema in branch vein occlusion. Group, The Branch Vein Occlusion Study. 3, 1984, Am J Ophthalmol, Vol. 98, pp. 271-282. 2. The epidemiology of retinal vein occlusion: the Beaver Dam Eye Study. Klein R, Klein BE, Moss SE, Meuer SM. 2000, Trans Am Ophthalmol Soc, Vol. 98, pp. 133-143. 3. 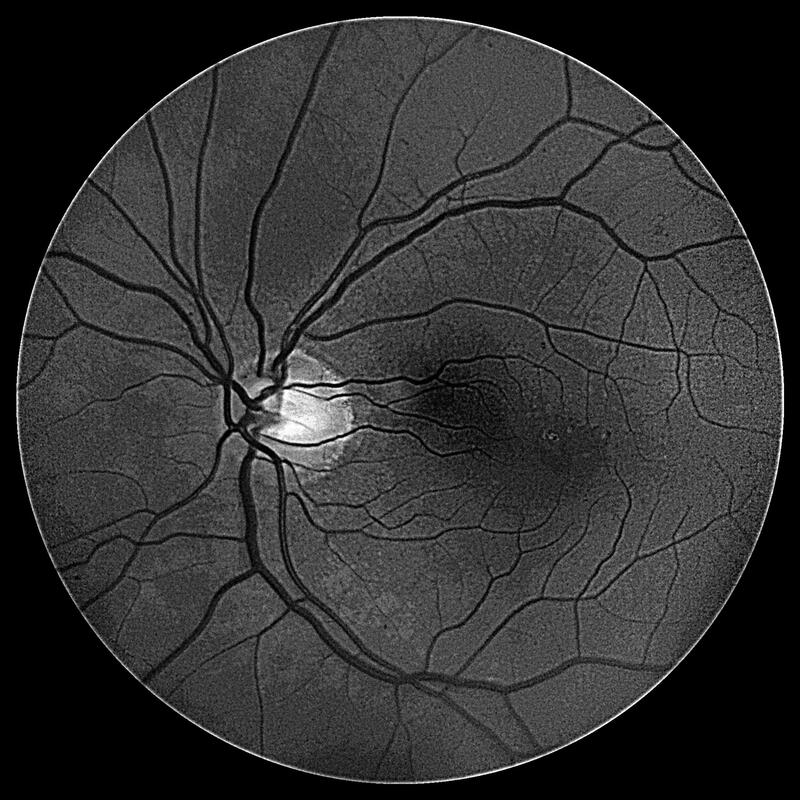 Natural history of branch retinal vein occlusion: an evidence-based systematic review. Rogers SL, McIntosh RL, Lim L, Mitchell P, Cheung N, Kowalski JW, Ngueyn HP, Wang JJ, Wong TY. 6, June : s.n., 2010, Ophthalmology, Vol. 117, pp. 1094-1101. 4. Laser-tissue interaction studes for medicine. GR, Kulkarni. 1988, Bulletin Mat Sci, Vol. 11, pp. 239-244. 5. Micropusled diode laser therapy: evolution and clinical application. Sivaprasad S, Elagouz M, McHugh D et al. 6, Nov 2010, Surv Ophthalmol, Vol. 55, p. 516. 6. Upregulation of pigment epithelium-derived factor after laser photocoagulation. Ogata N, Tobran-Tink J, Jo N, et al. 3, Mar 2001, Am J Ophthalmol, Vol. 132, pp. 427-429. 7. Effect of pan retinal photocoagulation on the serum levels of vascular endothelial growth factor in diabetic patients. Manaviat MR, Rashidi M, Afkhami-Ardenkani M, et al. 4, Aug 2011, Int Ophthalmol, Vol. 31, pp. 271-275. 8. Short-pulse laser treatment: redefining retinal therapy minimizing side effects without compromising care. Paulus YM, Palanker D, Blumenkranz MS. Jan-Feb 2010, Retinal Physician, pp. 54-59. 9. Subthreshold grid laser treatment of macular edema secondary to branch retinal vein occlusion with micropulse ingrared (810 nanometer). Parodi MB, Spasse S, Iacono P, et al. 12, Dec 2006, Ophthalmology, Vol. 113, pp. 2237-2242. 10. Intravitreal triamcinolone acetonide injections in the treatment of retinal vein occlusions. Roth, DB, Cukras C, Radhakrishnan R, Feuer WK, Yarian DL, Green SN. 6, Nov-Dec 2008, Ophthalmic Surg Lasers Imaging, Vol. 39, pp. 446-454. 11. One-year results after intravitreal bevacizumab therapy for macular edema secondary to branch retinal vein occlusion. Jaissle GB, Leitritz M, Gelisken F, Ziemssen F, Bartz-Schmidt KU, Szurman P. 1, Jan 2009, Graefes Arch Clin Exp Ophthalmol, Vol. 247, pp. 27-33. 12. 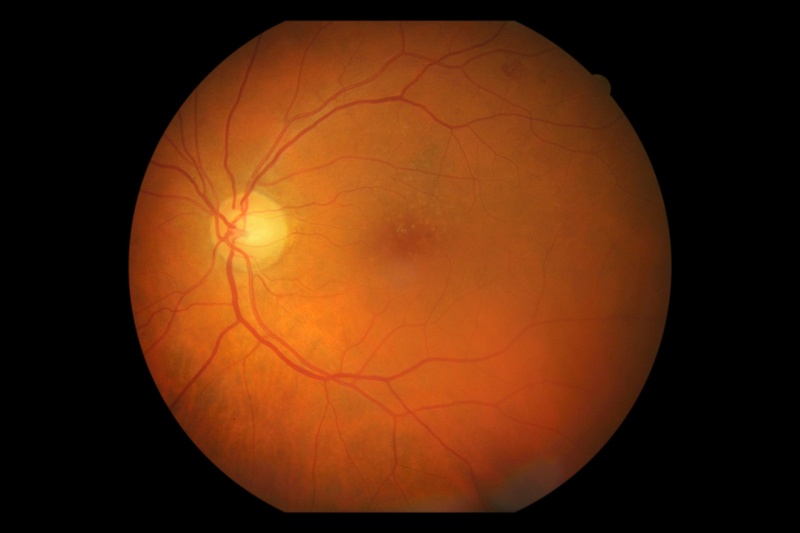 Intravitreal bevacizumab (Avastin) for macular oedema secondary to retinal vein occlusion: 12-month results of a prospective clinical trial. Prager F, Michels S, Kriechbaum K, Georgopoulos M, Funk M, Geitzenauer W. 4, Apr 2009, Br J Ophthalmol, Vol. 93, pp. 452-456. 13. JW, Santrock. A Topical Approach to Life Span Development. New York : McGraw-Hill, 2008. pp. 221-223. The prevention of tooth decay and gingivitis has been a long established practice in Dentistry. The first American to patent a toothbrush was H. N. Wadsworth and many American companies began to mass-produce toothbrushes after 1885. The practice of minimizing and removing plaque has become common knowledge and both the at home maintenance as well as the in office components to teeth cleaning have become part of our culture. The knowledge of gum disease by the individual is pervasive which helps to promote good oral health in the general North American public. But what about our eyes? Little common knowledge exists on lid disease and how lid hygiene is proving to be a critical point in the prevention of glandular dysfunction of the lids as well as chronic inflammation which leads to dry eye disease (DED). What we do know is that symptoms in the majority of cases exist well past the onset of the disease itself. Eye doctors are well equipped with tools to help identify and in fact manage the early manifestations, but don’t even realize this therapy exists. In fact, only recently at the American Academy of Optometry during the Section on Cornea, Contact Lenses and Refractive Technologies Symposium delivered by Dr. Kelly Nichols and Dr. Caroline Blackie OD PhD did the concept of lid staining and cleaning actually enter the realm of management options for meibomian gland dysfunction (MGD) and evaporative dry eye. The Line of Marx (LOM), which is an anatomical junction between the wet conjunctiva of the inner eyelid and the dry lid surface, can only be visualized using vital dyes like fluorescein, Rose Bengal or Lissamine Green. In healthy younger eyes, this line is uniform and thin running the span of the upper and lower eyelid. It runs behind the meibomian gland orifice (MGO) or opening. In the aging eye, and eyes that have a pro-inflammatory environment such as a dry eye with hyperosmolar tears or higher concentrations of biomarkers such as MMP-9, this region can thicken and run through or even past the MGO. In fact, in hyperosmolar tears, LOM can provide a solute gradient that is a pathway for mediators of cell death and inflammatory proteins directly to the MGO thereby advancing MGD and decreasing the meibum quality and likely contributing to obstruction of the gland (Bron, et al 2011, The Ocular Surface). Meibomian gland dysfunction (MGD) is a chronic, diffuse abnormality of the meibomian glands, commonly characterized by terminal duct obstruction and/or qualitative/ quantitative changes in the glandular secretion. It may result in alteration of the tear film, symptoms of eye irritation, clinically apparent inflammation, and ocular surface disease. The build up of epithelial debris or ‘plaque’ at the LOM can be easily viewed with vital dyes as seen in the image above. Like the plaque on your teeth, the physiological insult of this ‘dead skin’ build up on this tissue results in further degradation of the LOM and therefore creating a stronger path to the MGO. We see this natural thickening of LOM in the aging eye (Yamaguchi et al, 2006, Am J Oph), however in patients with evaporative dry eye, this thickening is accelerated. A simple in office procedure under optional topical anesthetic can be performed by an ophthalmologist or optometrist to promote a healthy lid surface and therefore maintain the health of the oil glands in the eye lids – this inevitably will help to decrease the risk of developing the most common type of dry eye – evaporative dry eye reported in some cases to be part of 87% of dry eye patients. Lid cleanings should be added to the eye care recipe for good ocular health in a semi-annual fashion (every 6 months) in all patients particularly (but not limited to) contact lens wearers, patients with dry eye symptoms, psoriasis, 50+ patients and female patients. Being a separate procedure altogether, patients should be aware of specialty fees associated with the service being provided, not unlike that observed in dentistry. Please note that this is VERY new to eye care and may not routinely performed in general clinics so please seek out your nearest dry eye or ocular surface disease facility which may be better equipped to manage of the micro-anatomy of the eye lid and associated conditions. Dry Eye Quarterly – First issue! 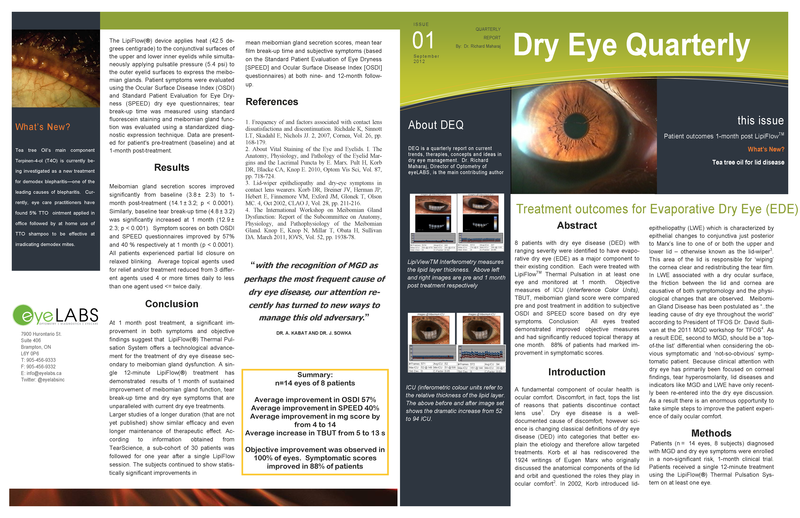 First edition of Dry Eye Quarterly – see clinical trial results from eyeLABS dry eye clinic. 88% of patients treated with symptomatic relief and 100% of patients have significant clinical improvement after only 1 month!